The film society program for the first four screenings of 2015 is below. Later screenings are decided as the year progresses. Anyone can come to these films: you do not need to be a member of the film society, but the significantly discounted tickets are only available to members. And for a subscription price of only $80 for 10 films, why not be part of this exciting film program and see films that many people never get a chance to see! Unless otherwise advised films are at 7pm, usually on the third Sunday of each month. 19 Apr, 7pm – Locke (MA 15+) Ivan Locke has worked diligently to craft the life he has envisioned, dedicating himself to the job that he loves and the family he adores. On the eve of the biggest challenge of his career, Ivan receives a phone call that sets in motion a series of events that will unravel his family, job, and soul. All taking place over the course of one absolutely riveting car ride, Locke is an exploration of how one decision can lead to the complete collapse of a life. 16 August 7pm – Women He’s Undressed (PG) Orry-Kelly, the boy from the small NSW coastal fishing village of Kiama, ran from the sheltered shores of Australia to chance his luck in the anything goes world of New York. He would soon find himself seduced by the bright lights and big dreams of Hollywood, where his unbounded wit and talent would lead him to design gowns that lit up the golden age of cinema, his journey finally brought to life in Gillian Armstrong’s film. Women He’s Undressed takes us behind the scenes of Hollywood, with a little help from some of Orry’s long time friends and colleagues, to reveal one of tinsel town’s best kept secrets and bring home the story of the boy from Kiama – friend and confidante to the screen greats of Hollywood’s golden age and a designer whose costumes created some of the most magical moments in cinema history. This classy documentary, packed with clips and interviews, traces the life and work of this under-appreciated Aussie genius. 20 September 7pm – The Lunch Box (PG) A charming romantic comedy from India about how a mistaken delivery in Mumbai’s famously efficient lunchbox delivery system connects a young housewife to an older man in the dusk of his life as they build a fantasy world together through notes in the lunchbox. Lonely housewife Ila (Nimrat Kaur) decides to try adding some spice to her stale marriage by preparing a special lunch for her neglectful husband. Unfortunately, the delivery goes astray and winds up in the hands of Saajan (Irrfan Khan), an irritable widower. Curious about her husband’s lack of response, Ila adds a note to the next day’s lunchbox, and thus begins an unusual friendship in which Saajan and Ila can talk about their joys and sorrows without ever meeting in person. Can you fall in love with someone you have never met? 18 October 7pm – Wild Tales (MA 15+) An Argentine-Spanish black comedy, written and directed by Damian Szifron. It tells six dark stories, each involving savage situations full of revenge, which change the lives of people who are involved in them. Wild Tales is said to be wickedly hilarious and delightfully deranged. 15 November 7pm – The Nightingale (G) A French and Chinese co-production with English subtitles. It follows the story of a young girl left in the care of her previously estranged grandfather living in a small and modest apartment in Beijing. The two set out to visit the grandfather’s hometown in the country which becomes a journey of understanding and friendship. 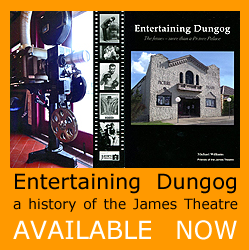 The Dungog Film Society, now part of the Friends of the James Theatre Inc, has over 45 members, and brings quality films to be seen on the big screen in Dungog. Apart from the monthly film society program, the Friends organise other special screenings such as AGOG – a Feast of Foreign Films and Flickerfest. So why not join us and get your friends involved too? YOU DO NOT HAVE TO JOIN THE FILM SOCIETY TO COME TO THESE FILMS. Even if you do not wish to take out a subscription, we encourage you to check our program and come to any film that appeals to you – we are sure that some of them will! Tickets can be purchased for $12 at the door. 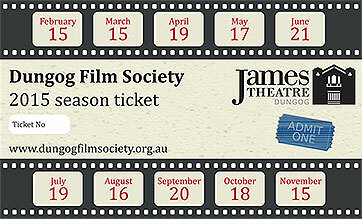 When you join the Dungog Film Society you join the Friends of the James Theatre and you get a season ticket for $80, which provides entry to all ten of the monthly films we show this year (expected to be ten films). The ticket is transferable and can be used for entry by other people, so if you do not like one film you may bring 2 people on your ticket to the next film, or 7 people to one film !! Tickets are also available at the door for $12. If you would like to become a member fill out the form below and click the submit button. We will send you details for making the payment and picking up the season ticket.